Once upon a time Otis Nixon was a terrible baseball player. How do I know? My K-Mart manager and I kept getting his 1988 Topps baseball card out of the vending machine that entertained us at break time. The number still astounds me: .059 was his 1987 batting average. We started following his Expos career. We were on Otis Nixon watch. Finally he was featured on Baseball Tonight. A pitch had bounced several feet in front of the plate. Otis had swung hard for strike three. It bounced so wildly he had a chance to advance to first on a dropped third strike. But then Otis fell flat on his face in the dirt. They kept showing it over and over: “first he can’t hit, then he can’t run.” It was bad. Oh how the Otis had fallen. Flat on his face. The Atlanta Braves came calling for Otis Nixon. They saw something nobody else could see. They gave him a shot on a winning team. With a new purpose Otis gave his all. People still remember “the catch”. Andy Van Slyke had hit a monster shot a foot above the wall for a sure home run. But Otis was not having any of that. He jumped high. He planted his cleat on the wall. He jumped far above the wall and snagged that ball out of the night sky. ESPN played it over and over and over, erasing the bad memories. He went on to play in the World Series with the Braves as a career .270 hitter. Not bad. The weight of Simon Peter’s net nearly pulled him out of the boat. They had snagged the mother lode. Someone said, “It’s the Lord!” Peter ran to shore and Jesus was cooking breakfast around a charcoal fire. (Yeah now that Jesus was a stickler for bringing things full circle.) The risen Jesus cooking you breakfast. Not bad. Has asked Simon to bring some of the fish he had caught. Then he asked something else of Simon. Three times. Do. You. Love. Me? Each time Simon said yes, Jesus gave him a mission: Feed my lambs, tend my sheep, feed my sheep. It hurt. But Jesus was helping Simon face the past and move forward. Fishing wasn’t the thing anymore. People were the thing. Other people. Simon Peter went on to the big leagues of apostleship. He healed some beggers. Preached some pretty awesome sermons. Got it wrong some days. But got it right, too. He laid down his life like his master did. John 18-21, the Book of Acts and 1-2 Peter tell the story in all its glory. John 21:1-19 are featured in the glorious art above. I found it here. Our lives can have a high purpose if we don’t get distracted by failure. Otis Nixon has been battling some demons in recent years. But I’m pulling for him. There is always one who believes in us. Jesus. With Jesus there is always hope and a future. Often there is no happily ever after, even with Jesus. Instead, each day we get the same opportunity. Jesus offers each one of us a simple two word mission: follow me. Let’s keep it simple. Let’s take care of people in Jesus’ name. Today is the second Sunday of Easter! Today we revisit the hours immediately following the resurrection of Jesus. Luke 24:13-35 (with a stranger along the Emmaus Road) This story gives us a fabulous picture of what life is like for Christians after the resurrection. The most incredible thing to ever happen has happened. The new creation has been inaugurated. Christ, the firstfruits of the resurrection, has risen from the dead. Some followers, especially the women, are already announcing the good news full time. Everything has changed. But not everyone has been changed. Why does faith come easier for some people than others? Does your heart burn within you for the things of God? Or, do you not always feel much when you pray? Are you regularly hungry for time with Jesus? The answers are not always obvious. What is clear? The never ending compassion of Jesus. He cares. More than that, he seeks out those who are wandering away from the center of faithful living. Cleopas and the other disciple thought they were leaving bewildering events behind as they travelled the road to Emmaus. What they discovered blew their minds. Set aside your expectations. Bring your whole surrendered self to worship today as we travel the road to Emmaus together. Someone might show up along this road. The choice is yours… Should he stay or should he go? Tonight was my final 2 mile training run for the Chicago Marathon. A final short lap around the neighborhood. It felt good and the first mile was my fastest since my injury. I’ve done all I can. Now the countdown to Sunday begins! I want to thank everyone who has prayed for me, encouraged me and/or donated to Team World Vision. As I run on Sunday you are the wind at my back! THANK YOU!!! 4 miles 49:55 Click to get me to the finish line! I’m so close to my goal! I completed my final 4 mile training run in my fastest time by far at this distance. I didn’t set out to beat my time but it happened anyway. 20.2 miles of my marathon are now covered by $50 donations to Team World Vision! As I enter the home stretch, will you consider donating? I need 6 more $50 donations by Sunday. I know we can do it together. Thanks for your prayers and support. Please click here! to help me reach my goal of raising $50 for clean water for every mile of the Chicago Marathon! Yesterday I completed the prescribed 8 mile run in my fastest time yet! It felt great! It’s my last long run in the training. The marathon is 1 week from today! It hasn’t been easy and I so appreciate all the support from so many friends. I need a few more to donate to put me over the top. I’ve raised $975 out of a needed $1,310. It’s very important that I reach the goal. If you can donate it will literally change someone’s life. $50 provides clean water for one year for one person. It’s a sacrificial gift but one you can know is making a difference in the world. Special thanks to so many who have donated. I don’t want to fall short after coming so far! Thanks for your help! 12 miles exactly 3hrs Click here to support my marathon run! It was another beautiful day. I had to run later in the day, which is never my friend, but I made it the scheduled twelve miles. I had to stop briefly at 9.48 miles due to back spasms. After 5 min of sitting my back loosened up and I was back on the road. It has been a very busy week and my highest mileage week since the injury. I’m thankful and fixed on one thing: the finish line on October 11th! Thanks for your support! I continue to make steady improvement! Five minutes faster than my last attempt at 4 miles (30 seconds faster than before my injury). 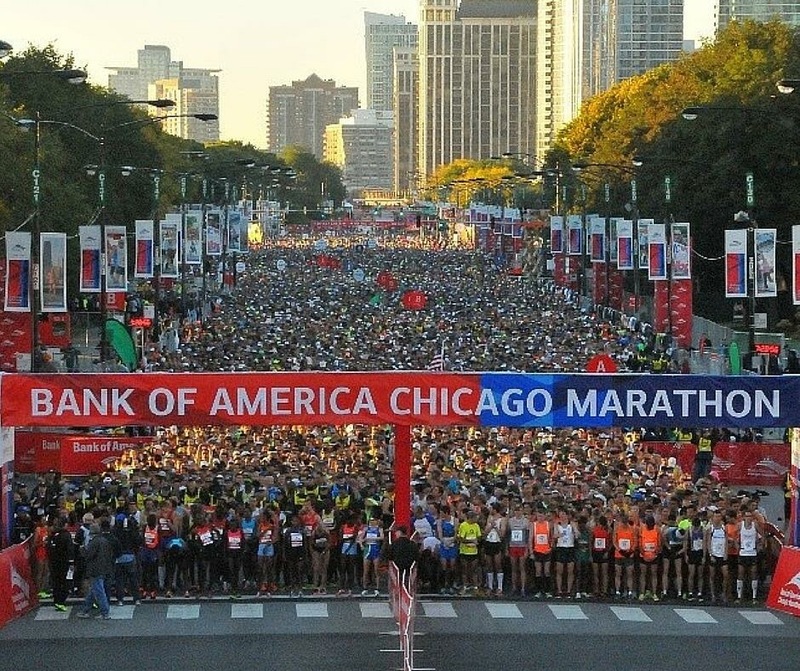 My goal is to complete the Chicago Marathon on October 11th, raising $1,310 for Team World Vision. That’s $50 for every mile of the marathon. Your $50 donation delivers clean water to one person for one year. (Any size donation is happily accepted.) Click here to donate!